Biryani may be Hyderabad's signature dish, but even the world-famous delicacy takes a back seat during the holy month of Ramadan in favour of haleem, a porridge-like dish made of wheat, lentils and meat. Though the mouth-watering dish is a regular on the menu in many Muslim weddings and is also available round the year at a few city hotels, it's only during the fasting month that it is in great demand. It's not just the Muslims but people from other communities as well eagerly await Ramadan to relish their favourite dish. Those travelling abroad or to different destinations within the country don't forget to pick up a few packets of haleem for their relatives and friends. 'Bhattis' or brick-and-mud ovens in front of hotels across Hyderabad are a common sight during the holy month. And so are chefs engaged in the laborious process of making the sumptuous dish in large vessels cemented on the traditional ovens. "The Legendary Cuisine of Persia", a highly acclaimed cookbook, traces the origin of haleem to the 6th century Persian king Khusrow. A chef from Yemen is said to have first prepared the dish, also called "harees" or "harissa" in Arab countries, for the then Nizam of Hyderabad in 1930. Subsequently, some Irani hotels started selling it here. Over the decades, the syrupy dish was Indianised with the addition of local spices, dry fruit, clarified butter or "desi ghee" and the unique style of cooking. 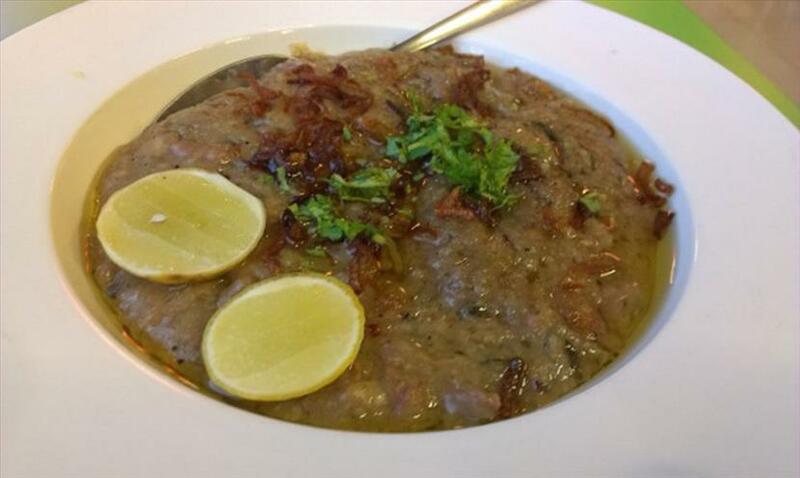 As the "Iftar" time approaches, dozens of workers start packing or serving piping hot haleem garnished with special spicy "shorba" or meat broth, caramalised onions, coriander, and slices of lemon. While haleem was originally made with mutton or beef, it's now available in other variants -- chicken, fish, and even vegetarian. 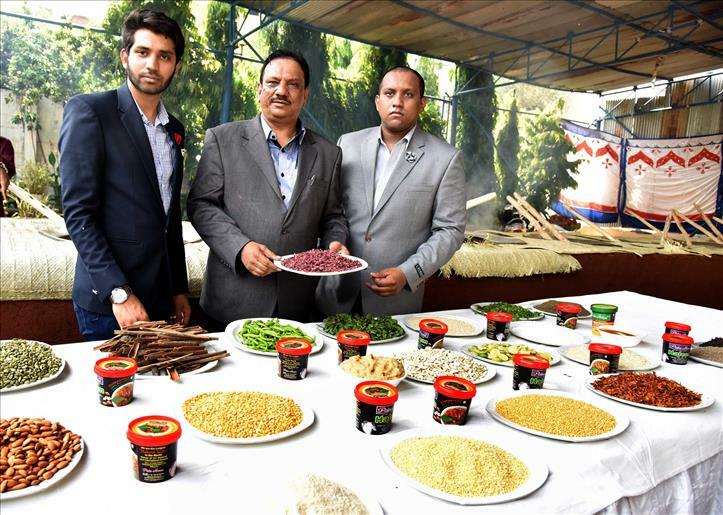 MD M. A. Majeed (centre) of Pista House showing Haleem ingredients. Priced at Rs 160 per plate (300 gram), Pista House's haleem this Ramadan is available at over 225 outlets across Hyderabad, Bengaluru, Chennai, Vijayawada, and Kadapa, besides all major towns in Telangana. Pista House, which also offers an innovative "diet haleem" and "organic haleem", was this month invited by the European Union Intellectual Property Office to showcase Hyderabadi haleem at the Thailand Food Exhibition 'THAIFEX 2017' in Bangkok. "It is a rare honour and great recognition for us," Pista House owner M.A. Majeed said.